Three former Camelot students playing with trucks. The following are the objectives for the academic year that the daily, weekly and monthly lesson plans are based on. These core objectives are developmentally appropriate for four to five year old children and include the basic skills necessary for a successful transition into kindergarten. Regular staff meetings are held during the year to discuss if the objectives are being met and changes to the lesson plans are implemented if necessary. Discussions are also held to develop alternative activities and strategies if any individual falls outside the normal range of development during the year. The objectives are subdivided into three areas, cognitive, social and motor skill development. The child demonstrates the ability to write their first and last name in print, using correct technique in letter formation and without aids such as highlighters, or their name printed out for them to copy from. The child is able to recite his or her own address and telephone number. The child can correctly identify all of the letters in the alphabet in print (shown non-sequentially). Correctly identify at least seven shapes. Demonstrate the ability to count up to and down from twelve and understand the concepts of subsets, addition and subtraction of single objects from the total. Name the four seasons and identify at least two characteristics of each season. Answer basic questions regarding the content of a story read to them demonstrating an understanding of the plot, characters and story line. Demonstrate successfully the ability to follow multiple directions for task completion and perform the necessary prerequisites (such as writing their names at the top of the page and getting the necessary supplies) without direction. Demonstrate the ability to place in the correct sequence routine events depicted in four picture story lines. Show the pre-literacy skills of sounding out words by letter, recognizing the first letter in a word by sound and utilizing the beginning principles of phonics. The method for fostering the cognitive development of each child is through weekly thematic presentation of concepts, letters and numbers during project, skill enrichment and circle time. Each theme offers the opportunity to promote numeracy and literacy learning in a varied way to engage the child. Daily calendar, weather review, worksheets, computer time, number and alphabet flash cards and games offer the necessary repetition to foster cognitive development of basic skills. The method for determining if the desired objectives have been achieved is through tests using flash cards and student/teacher interviews. A standard test is given at the beginning of the year and at the end of the school year to each student for comparison. Results are then presented to the child’s parent or guardian at end of year parent teacher conferences. Any irregularities in cognitive development are brought to the attention of the parents immediately. Demonstrate pro-social behavior including the ability to share, take turns, forgive, apologize and show consideration for others feelings. Use good manners on a regular basis without prompting. The proper etiquette to include, saying please thank you, and excuse me. 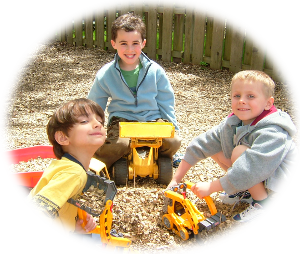 To play cooperatively in both small group and large group activities, behavior should include; taking turns, sharing, participation in dialogue and the ability to participate during “free” play time with others beyond parallel play. Demonstrate the foundations of the necessary skills to manage aggression, anger and frustration. The method for promoting positive social development of the children in the class is through positive reinforcement of proper behavior, verbal reminders of good social behavior, teachers setting a good example of behavior and reading stories, doing activities and initiating discussions that touch on the concepts of pro-social behavior. The method for testing if the objectives are being met is through observation of general class behavior and constructing situations that can be monitored to record the specific social interactions. Summaries as to each student’s social development are included in the final school report. Any irregularities in a child’s social development are brought to the attention of the parents immediately. Demonstrate proficiency in using small manipulatives including counting beads and disks, threading cards, magnets, Lego and building blocks. Use the computer mouse correctly to execute simple computer activities. Perform gross motor skill activities including throwing and catching a soft rubber ball, jumping on two feet forward and backward, hoping, walking on a balance beam, skipping and galloping. Demonstrate confidence in performing the basic gross and fine motor skills necessary in every day living. The method for gross motor skill development is through both structured physical activities and unstructured playtime in the gym and playground. The method for fine motor skill development is through performance of a variety of projects in the daily curriculum that utilize materials including scissors, paint, glue pencils and crayons. During directed class time play, a variety of small manipulatives are made available for the children to work with. The method for testing is through collecting and comparing samples of work completed throughout the year. End of year worksheets and skill tests demonstrate the abilities and accuracy of the child in task performance. Any irregularities in gross or fine motor skill development are brought to the attention of the parents immediately. By assessing each student at the beginning and end of year we are able to provide parents with detailed information regarding their child’s progress, areas of strengths and areas requiring further development. Detailed information is vital when making decisions pertaining to the child’s transition to kindergarten, the possible need for any early intervention and most importantly, insuring we are engaging and challenging each child so that they may develop to their full potential.